Congratulations to our U13 players and management team on their excellent 3-6 to 2-3 victory over The Nire in the Western Division 1 Football Final played at Fraher Field this morning. This win secured our third divisional title in four years at this grade. 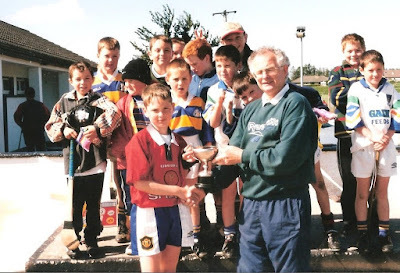 This week's photo shows Larry Cliffe presenting John Gorman with a trophy to mark his team's victory in a club hurling blitz in the mid 1990s. 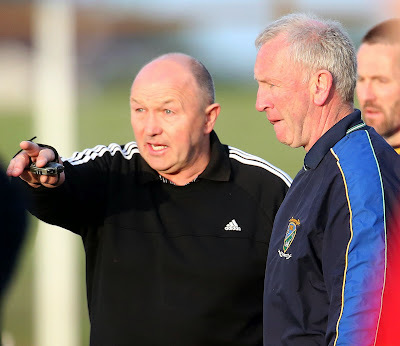 Tremendous work has always, and continues to take place, at underage level in the club, the successes of which have been seen over the years and indeed in the last few weeks. Our ever popular Jack the Joker fundraiser continues this Sunday night in Minnies Bar where the jackpot is €2,000 as on Sunday night last Kevin Tobin and Mark Crotty were drawn out and chose card number 20 which when turned was the Joker so both men share the jackpot of €7,200. Kay O’Connor and Isabel Moore won €25 each. As well as our group of ticket sellers tickets can be purchased from Convenience Store Ballinroad, Village Flowers, Spar, Mousies Takeaway, Minnies Bar and Crottys Corner Bar. On Sunday afternoon last we were defeated by Mt. Sion in a very high scoring game in Abbeyside in the Sargent Cup. 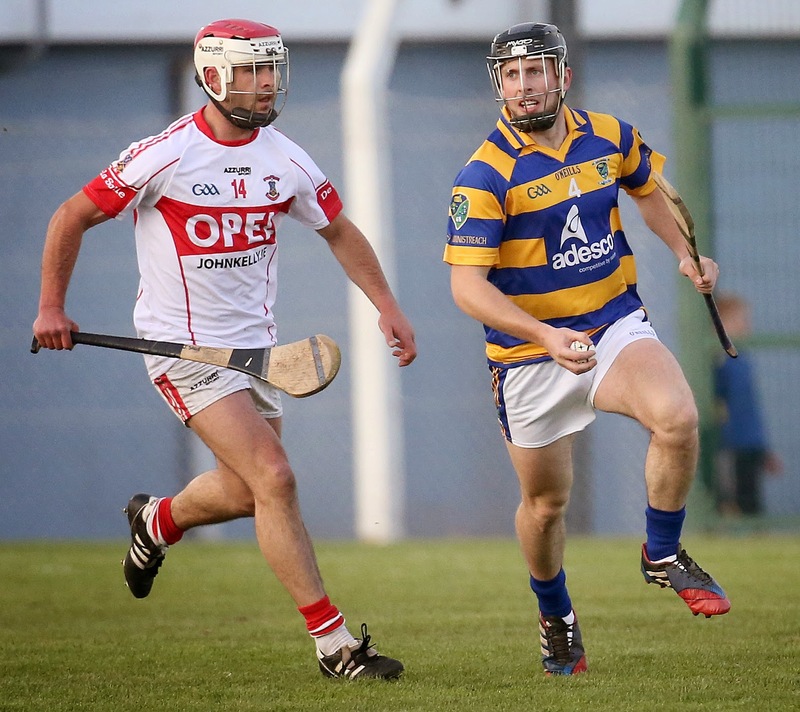 On Friday night last our Junior B hurlers recorded a very good win over Glen Rovers in the Western Championship in Bushy Park. 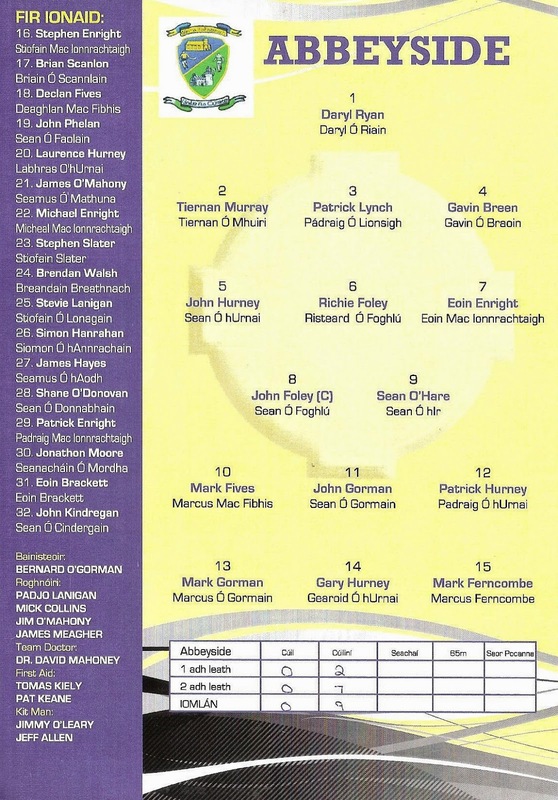 TEAM: S. RYAN, P. BERGIN, D. BYRNE, A. O’RAGHNAIGH, C. O’DWYER, D. MORRISSEY, P. COLLINS, J. MULLEN, N. DEE, O. YOUNG, D. HICKEY, I. KIELY, M. MAHER, J. MOORE, R. RYAN. SUBS: J. BERESFORD, J. ORGAN, S. O’CONNOR, D. O’HARE, T. COLLINS. This Wednesday night we play Rathgormack in the semi final of the Phelan Cup in Kilmacthomas at 7:30pm. 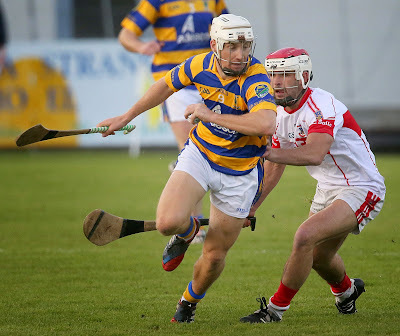 We play Dungarvan in the Western Championship this Friday night at 7pm in Fraher Field. This Saturday night we play Ballysaggart in Colligan at 7:30 in the Western Championship. On behalf of all in the club we would like to wish both the Waterford Senior and Junior Footballers the very best of luck, especially to the club players involved, ahead of their Munster Championship games against Tipperary in Thurles this Sunday. Our Club Bingo will continue this Sunday night in the CBS Hall where the jackpot is €1,650. The Abbeyside U12 Camogie players travelled to Dunhill to play the 2nd blitz of the year. 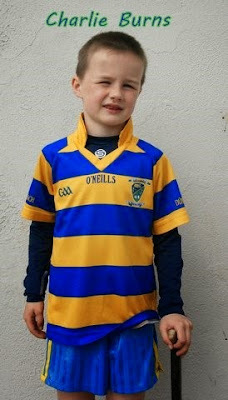 Due to Communions in other clubs Abbeyside and St Anne’s were the only 2 clubs playing. We played 12 aside games with 4 quarters of 12 minutes. The girls had a good workout coming out on top in a well contested game with excellent skillful camogie on display. Thanks to all parents who assisted in ensuring all of the girls had transport to the venue. Thanks to St Anne’s for the excellent hospitality. The U12 championship is starting on Tuesday 2nd June and will continue every Tuesday for 5 weeks into July. Opposition and venues to be confirmed. Navy skorts must be worn for the U12 championship. We are entering a team in the U13 summer league this year, dates to be confirmed. Girls playing U12 this year and who played U12 last year are eligible to play in this. Training for this group continues Friday evenings in Abbeyside field from 17:00-18:00. Panel for the day: Laura Murray, Megan Foley, Hannah Walsh, Emma Reynolds, Ellen Power, Cliodhna Roche, Kaia McGovern, Heather O Reilly, Ellie Daly, Moya Kiely, Caoimhe Ni Mhurchu & Lauren Maher. A massive well done to our U14 players and management team who won the Western Division 1 Football Championship Final this morning at Fraher Field. The young boys defeated An Ghaeltacht 6-6 to 2-6 in windy conditions, thereby securing our thirteenth divisional title at this grade and first since 2003. A remarkable five days has seen the club win one Western and two County Football titles. Congratulations to all involved. Congratulations to our U16 Football panel and management on their superb 2-11 to 2-5 victory over De La Salle in this morning's County Division 1 Football Final played at Fraher Field. This win secured our seventh title at this grade and our second in three years. 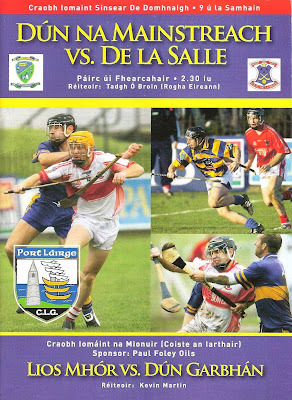 Further to last week's programme cover for the 2008 County Senior Hurling Championship Final, this week's photo shows the team and substitutes that lined out on that miserable day in November. 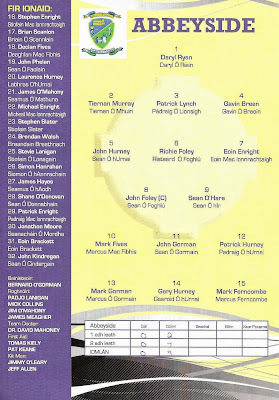 Six of the starters in 2008 lined out at the beginning of the match against De La Salle last Saturday night. Our ever popular Jack the Joker fundraiser continues this Sunday night in Alice O’Connor’s Bar where the jackpot is €7,200. On Sunday night last Kevin and Nora Tobin were drawn out and chose card number 44 which wasn’t the Joker although they did win €50. Bonnie Mills and Marie and Shirley won €25 each. As well as our group of ticket sellers tickets can be purchased from Convenience Store Ballinroad, Village Flowers, Spar, Mousies Takeaway, Minnies Bar and Crotty’s Corner Bar. On Saturday night last we recorded a fantastic victory over De La Salle in the second round of the County Championship in Fraher Field. 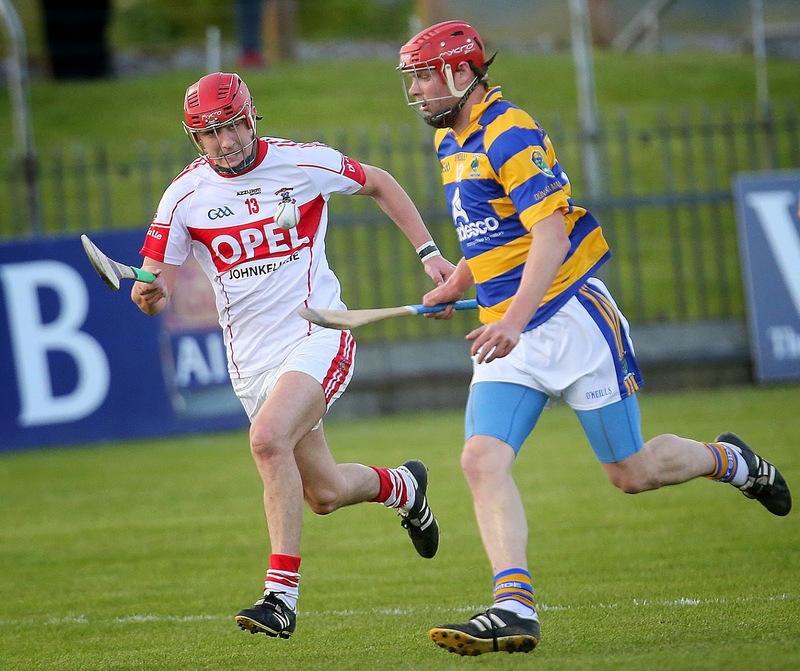 The team played great hurling on the night to maintain our unbeaten run in both Championships to date this year. Our next game in the Championship is against Tallow, for which no date has been finalised. This Sunday we play Mt. Sion in the County League in Abbeyside at 2pm. TEAM: S. DALY, E. BERGIN, C. PRUNTY, S. O’DONOVAN, M. POWER, S. O’HARE, E. COLLINS, D. COLLINS, R. FOLEY, P. HURNEY, J. HURNEY, M. O’HALLORAN, M. FERNCOMBE, G. HURNEY, S. CLIFFE. SUBS: B. LOOBY, D. McGRATH. On Sunday afternoon last our Junior Hurlers continued their winning start to the Championship with a good win over Kilgobnet in Bushy Park. TEAM: L. POWER, M. COLEMAN, D. HENLEY, S. O’GORMAN, P. LYNCH, S. BRIGGS, S. O’CONNOR, D. FERNCOMBE, C. KINDREGAN, E. ENRIGHT, M. FIVES, J. POWER, J. O’BRIEN, L. HURNEY, J. O’RIORDAN. This Friday night our Junior B team play Glen Rovers in Bushy Park. We would like to wish our Minor Football team the very best of luck ahead of their County Final against Gaultier in Fraher Field tonight at 8:30 pm. 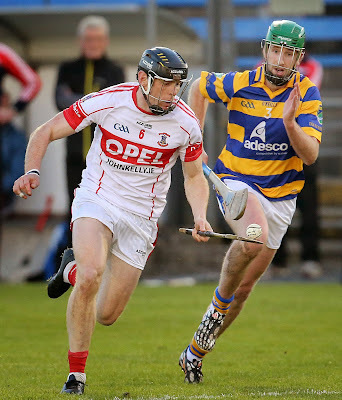 Any member who wishes to order tickets for the Munster Championship Semi Final game against Cork should give their name to Club Secretary Jonathan O’Donovan by this Sunday night. Our Club Bingo will continue this Sunday night in the CBS Hall where the jackpot is €1,600. Best of luck to our Minor football team who play in the County Final tonight Wednesday against Gaultier. Everyone in the club wish all the players and mentors involved the very best of luck. Eveyone in the club would like to congratulate all the children of the parish who have made their First Holy Communion in recent weeks and to those who will make them in the next few weeks. Our under 16 football team also take part in a county final this Saturday against De La Salle. Like our minor team we wish everyone involved the very best of luck. Our under 14 football team play in a Western Final this Sunday morning. For times of this game please look elsewhere in the issue of this paper. 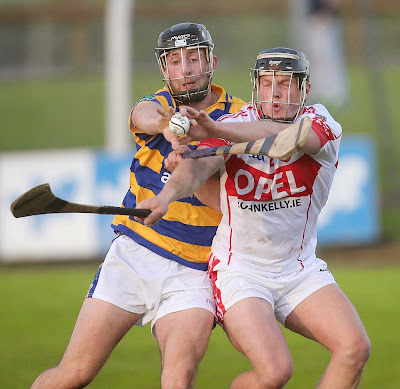 Our outdoor hurling sessions continue again on Saturday morning the 23rd May at our club grounds. These sessions will include under 6, 7 and 8s and will run from 10.30 to 11.30. 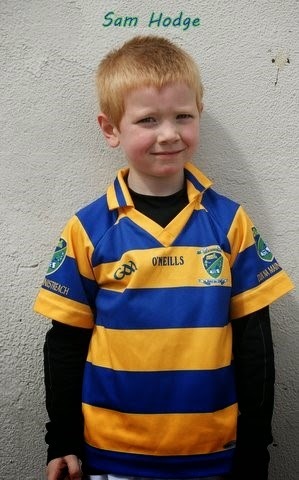 Our under9 team will train between the time of 11.30 and 12.30 at our wall ball. All are welcome to attend and it would be great to see some new faces. Helmets will be available to buy at a discounted rate at these sessions. Over the last few days we played a couple of challenge matches as we prepare for the Ballyduff Upper Festival of U10 Hurling. First up was Mount Sion, on a beautiful evening in Abbeyside where, after a slow start we played much better in the second half. This is a very good Mt. Sion team and a good learning curve for our lads. Then onSaturday morning just gone we travelled to Lismore, again a lovely morning for hurling. A great game was played by both clubs and you could see that the lads learned from the Mt. Sion game, with improvements all round the pitch. A couple more training sessions before Ballyduff (which is starting for us on Saturday 23rd) and we'll be well prepared for the tournament and we'll give it a right go. We are due to play De La Salle, Fourmilewater and Sarsfield. If we come out of the group we'll be playing the semi-final the following week. Also coming up we have an U10 Western Football Tournament. Dates for your diary regarding the football are: May 27th in Ballinameela,June 10th in Kilrossanty and June 24th in Cappoquin. Below are some action photos from Abbeyside's 2-17 to 0-20 win over De La Salle in Round 2 of the County Senior Hurling Championship played at Fraher Field on Saturday night last. 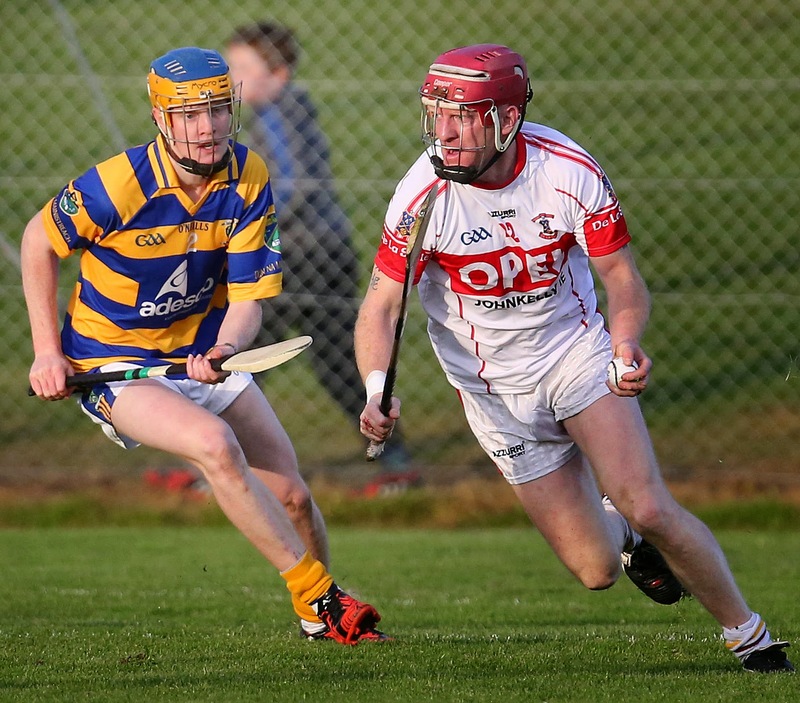 Many thanks to Seán Byrne Photography for providing us with these pictures. 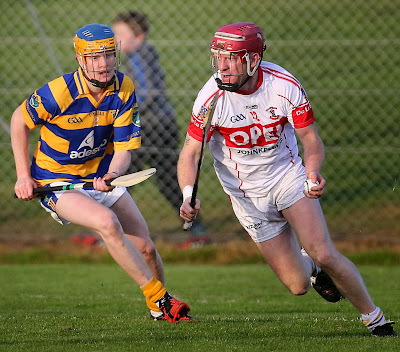 Tonight, Abbeyside plays De La Salle in Round 2 of the County Senior Hurling Championship at Fraher Field. This week's photo, a programme cover, brings us back to 2008 and arguably the most significant meeting between the two clubs; the County Senior Hurling Championship Final played at the same venue. On an atrocious day for hurling, there was heartbreak for the Villagers as De La Salle emerged victorious on a scoreline of 0-11 to 0-9. 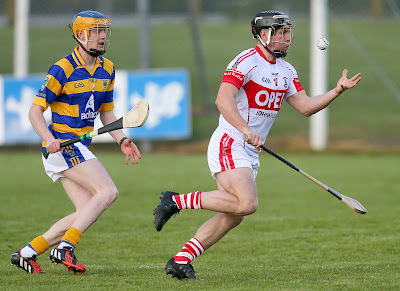 Our minor footballers are in action this evening (Wednesday) in the county championship semi final at the Fraher Field at 7 pm against St Declans Kilmacthomas. All support here would be very welcome indeed and best wishes are sent to everyone involved. Our under 14 hurling team played the Féile Hurling County Quarter Final on Tuesday night of last week. This was a cracking game of hurling where we eventually came out on top on a score line of 4-12 to 4-8. They will now play Roanmore this Wednesday evening in the semi final of this competition. Then on Thursday night last week this team were in action again but this time in football where we came out on top also. 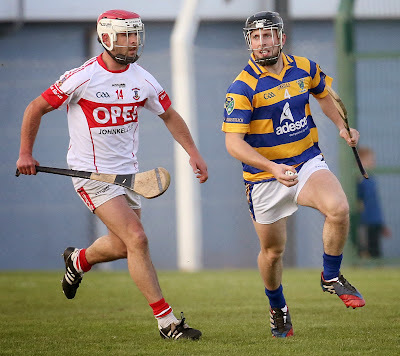 The opponents on the night were Dungarvan who put up a spirited performance throughout despite being up against a team for whom everything went throughout the match. Well done to all our under 14 team who are improving with every outing. Our under 16 football team were also in action last weekend in the semi final of the county football championship against Gaultier. We had to battle hard to come out on top in this game but battle we did to reach the county final on Saturday week. 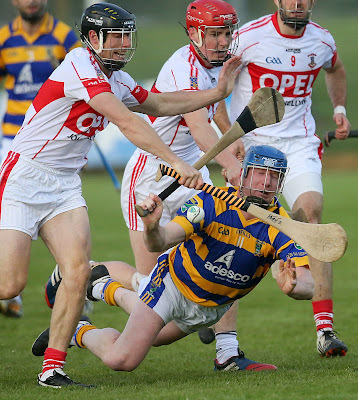 Our outdoor hurling sessions continue again on Saturday morning the 16th May at our club grounds. These sessions will include under 6, 7 and 8s and will run from 10.30 to 11.30. Our under 9 team will train between the time of 11.30 and 12.30 at our wall ball. All are welcome to attend and it would be great to see some new faces. Helmets will be available to buy at a discounted rate at these sessions. The Waterford GAA Cúl Camps are back again this year and this year they will take place in Abbeyside /Ballinacourty from June 29th to the 3rd July. Our club co-ordinator is Audrey and she can be contacted on (087) 6987388 for any information regarding these camps. Alternatively you can find information on these camps and book your place on www.kelloggsculcamps.gaa.ie.